Amope pedi replacements arrived in its original package. It was easy to replace the roller. It arrived in an envelope in the mail. 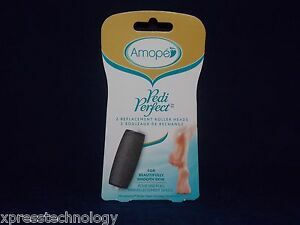 If you haven’t bought an Amope Pedi Perfect and suffer from cracked heels this is a great solution if you have one minute a day and can make it your daily routine. My daughter and I are fans! If your feet are already smooth, it can keep them that way, but its spin is to weak to get them smooth. If you have all kinds of time, it may work. Do not apply too much pressure on the spinning wheel, it will stop the rotation. If this had more power than what 2 AA batteries can handle it would be a better product. The Amope Pedi Pefect Roller Heads last a good long time, before you need to replace them. Good: Name brand product roller heads are sturdy and have great staying power to file down all the roughness on your feet. They WILL work...Just about the only thing I have found to smooth my feet. 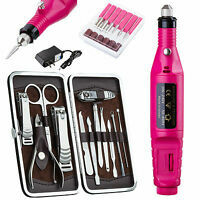 Personally this product does the perfect job, I have no need to use the diamond crystal replacement heads. These roller heads have the great same quality you get with your Amope foot file. The Amope file heads do what they are supposed to do. I bought an Amope foot file with a replacement head already included, and I just love it! I also bought four Amope replacement heads which have yet to be used, but they are the same ones that came with the Amope foot file. Highly recommended, easy to clean and maintain and does the job. Works good but does take awhile to get the dead skin off your feet. It comes with 2 different roller heads. 1 fine and 1 course. It does not indicate in the description wich ones you get. I would have liked that to be in the description because the fine one hardly does anything at all. I like the course one better. I feel as though I really ordered 1 roller because I would most likely never use the fine.